In the final years of World War Two, Partigiani – the Italian resistance fighters who were largely left leaning, openly socialist, or communist – liberated Northern Italy. This struggle, known as the Italian Civil War (8 September 1943 – 25 April 1945), ensured that the once vilified Marxist political ideologies would become central to post-war republican Italy. In the context of the Cold War and the Truman Doctrine, the popularity of communism and socialism in Italy represented an expansion of Soviet influence, and thus an existential threat to the United States. One of the first covert actions approved by President Harry Truman was ordered out of fear of a communist victory in the April 1948 Italian elections. In addition to overt diplomatic support for Italy’s government, the National Security Council recommended that a covert program be implemented to “actively combat Communist propaganda in Italy by an effective U.S. information program and by all other practicable means, including the use of unvouchered funds” (NSC 1/1). This covert action was the precursor to NATO’s formal clandestine operation in Italy known as Operation GLADIO (1948-1990). Operation GLADIO included a combination of propaganda, political action, and paramilitary action. Starting with the 1948 general elections, the CIA funneled money to political parties that opposed the Italian Communist Party (PCI) and Italian Socialist Party (PSI) in every election for 24 years. This aid was largely to help cover the costs of campaigning, posters, and pamphlets. The CIA also forged letters discrediting party leaders on the left. The paramilitary aspect of Operation GLADIO was to train anti-communist clandestine networks, which often recruited former fascist hardliners. The most direct political action took place in 1964 when Operation GLADIO supported a silent coup in which the socialist ministers were forced out of government. 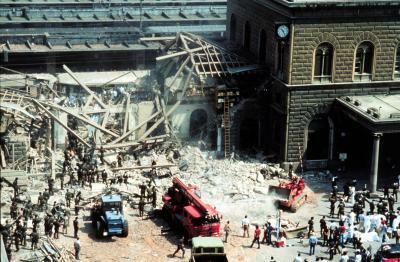 Operation GLADIO is inextricably tied to Italy’s “Years of Lead” (1960s-1980s), the period of Italian history in which extremist groups on the left and right committed domestic terrorism and targeted killings. Among these were the neo-fascist groups Ordine Nuovo and Rosa dei Venti, which carried out multiple bombings. Both of these groups allegedly had GLADIO-trained operatives among them carrying out bombing operations. GLADIO-trained operatives have also allegedly carried out “false flag” operations. Consider the case of the 1972 Paetano terrorist attack. The communist group Red Brigades was originally blamed until, in 1984, Vincenzo Vinciguerra – a fascist terrorist who claimed to have been supported by the GLADIO network – confessed. It is suspected that the Red Brigades’ assassination of Christian Democrat Prime Minister Aldo Moro in 1978 was also a “false flag” – the evidence being an alleged threat to Moro from Secretary of State Henry Kissinger and the involvement of the Banda della Magliana, an Italian criminal organization tied to GLADIO and the 1980 Bologna Massacre. Ultimately GLADIO was successful in ensuring that a socialist or communist government never held power in Italy until 1996. The strategy of tension employed by GLADIO’s intervention was effective in allowing the US to influence Italian politics by creating instability through polarization. However, the operation caused the deaths of many innocent Italians and arguably denied the country its right to national self-determination. Additionally, Italy’s politics remain highly unstable and volatile to this day. In terms of upholding the principles on which the United States was founded and preserving the long-term stability of a democratic Italy, this operation was a failure. Front National posters pasted onto the trees that line the Avenue Bosquet near the author’s home in the 7° Arrondissement of Paris, France, January 2014 (Alessandro Marazzi Sassoon). Following international headlines as of late, it would appear that the top story coming out of France concerns President François Hollande’s personal (read: intimate) life. Interestingly, none of the major American and British news agencies or papers mentioned France’s Jour de Colère (Day of Rage) demonstration that took place on January 26 in Paris. Numbering 17,000 according to the French police, and upwards of 120,000 according to other reports, the demonstration called primarily for the resignation of President Hollande. And the unrest had nothing to do with his personal life. Anger over unemployment, taxation, and a perceived infringement on civil liberties were just a few of the complaints levied by the demonstrators. The French media reported on the demonstrations, but the only substantial English-language news to be found was by VICE and consisted of a report by two eyewitnesses who left before the protests became violent. The apparent media blackout surrounding this protest makes it hard to determine what the impact of the protest was and who the protesters were. According to the protest organizers, the demonstration does not endorse any particular political party or figure, but upon closer examination their poster design suggests alignment with the far-right Front National (FN) party. A YouTube report of the protest revealed that among the demonstrators were neo-Nazis, members of the FN, members of the right wing student group Union pour la Démocratie Française (Union for French Democracy) dressed in all black, and a large contingent of Catholic-royalists. Some protesters called for a putsch or military coup, claiming the French army was the only institution that has not been “corrupted.” Corrupted by what? It is not clear, but anti-Semitism, anti-gay, anti-European Union, and anti-Finance sentiments were strongly expressed. The demonstrators, reminiscent of Tea Party activists, claim a deep love for their country as well as being defenders of “French identity.” It is unclear what that identity constitutes, but demonstrators made clear what it did not include. In addition to wanting to expel France’s Jews and immigrants – the government is already taking care of the Roma – demonstrators appeared to reject France’s democratic institutions. Cries of phony elections and a dictator president were just some of the sentiments expressed. Aside from statements by Manuel Valls, the Jewish Minister of the Interior who is often the target of anti-Semitic hate speech, noteworthy is the lack of condemnation from the French government. Valls condemned the violence and hate speech before the national assembly in a two-minute statement. He noted that a far-right rally of these proportions has not occurred in recent memory and the level of hatred expressed towards Jews was concerning. Valls condemned those who felt his deployment of law enforcement was excessive. He also passionately called for a unified rejection of the hate, anti-Semitism, and defamation of the French Republic the demonstrators represented. This message of unity is one seldom heard from French politicians. If the members of the National Assembly had any courage, they would do well to echo Valls’ condemnation of the protests. Instead, far-right deputies interrupted Valls thirty seconds into his speech and order had to be restored. France is a vital country in the EU and the Eurozone; its depressed economy remains the 5th largest in the world. A protest of tens of thousands of citizens on the far right in Paris does not mean that France will go the way of Greece. Nevertheless, the trend towards nationalism and xenophobia coupled with economic downturn is not new – it led to the rise of Fascism in Europe and should not be taken lightly by anyone. If you can hear the people sing, you may want to listen, especially in a country that has a propensity for violent revolutions. A bloody, under-reported conflict that has taken place in central Africa for two decades is explained through the legacy of the Rwandan Genocide and the Conflict Mineral Trade. Explaining The Kivu Conflict from Glimpse From the Globe on Vimeo.